Barking is a very natural means of communication for dogs; however, excessive barking is a nuisance not only to yourself but to others in your household and to your neighbours. Depending on the situation it can be a signal for loneliness, excitement, the need to go to the bathroom, fear, danger, excessive energy or boredom. However normal these signals may be when barking becomes dictatorial or excessive, it’s time to stop your dog barking. A new puppy will need your guidance to know when he should or shouldn’t bark. It is much easier to take corrective measures now while your puppy is young rather than have to try and mitigate a problem that has been allowed to develop into adulthood. Your new puppy may whine a great deal for that first couple of days. This really is normal behaviour for any young puppy that has been taken from his littermates and mother for the very first time. Being alone in unfamiliar surroundings will be upsetting for him. But regardless of how pitiful he is, don’t provide him attention when he’s crying or whining, or else you might be establishing a habitual practice of nuisance barking. Hold back until he stops barking before cuddling or petting him. Ensure that your puppy has enough food, water, attention, toys and exercise. Excessive barking can frequently be caused from excessive energy in your puppy and no way to expend it. Typically a puppy needs around an hour of active time. Take him for a walks on a daily basis to tire him and wear off this extra energy. This way, if you need to go out, he’ll sleep while you have gone. Another benefit of walking is he will be socializing with new people and new situations, so he’ll be less likely to bark at unfamiliar things. Puppies are social animals and need affection and a lot of interaction. Make time for your puppy every day and give him the love and attention he deserves. Remember, you have your job, friends, books, television and your dog has only YOU. If you are feeding your dog on a schedule stick to it. Dogs like routine and function best when you keep on it. Tips To Stop A Puppy From Barking? One easy way is to create a noisemaker from an empty pop can along with a couple of pennies. Place the pennies inside the can and tape it closed. Whenever your puppy barks or whines, especially during the night, shake the can at him. The sudden noise will startle him into silence. Each time he barks or whines, shake the can. This process is very effective because he isn’t getting your attention, or rather, positive attention. This will teach him that the only thing that happens when he barks or whines is that there is a loud noise that follows that he really does not like. He’ll learn rapidly that nuisance barking does not bring him your adornment. Another humane way of suppressing a barking puppy would be to say “enough,” and lightly put your hand around his muzzle. This is a sure thing as he can’t bark with his mouth shut. He’ll attempt to retreat, or shake your hands off, so be ready. Hold him by his collar so he can’t escape. Hold his muzzle lightly until he is quiet and stops fighting you. This implies that he’s recognized your authority. This method shows your pup that you are in control and enforces your position as the alpha dog. This is a really important lesson for him to understand, and will assist you in preventing many dog behavioural problems from developing later on. It’s useful to train your dog to bark on command. This might appear contradictory to what you are trying to achieve, however, the second part of this idea would be to train him to also stop barking on command. Now you’ve taken a stance of leadership and he will look to you for direction when it is appropriate to bark. If you continue to have difficulty, you may want to try the Innotek® Anti-Bark Spray Dog Collar that uses a harmless citronella spray to stop your dog’s excessive barking. 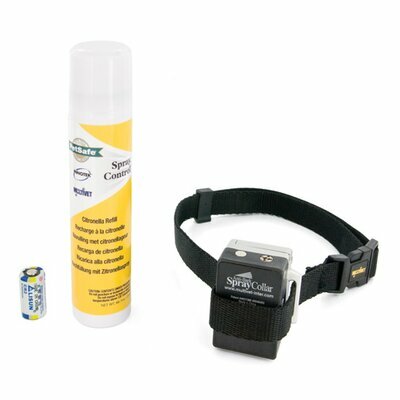 The collar is lightweight and comfortable and uses only one 6-volt battery. The collar releases a harmless citronella spray each time your dog barks which is an odor that your dog does not like. Once your dog realizes that barking causes the odor, the will refrain from barking. Recommended by leading animal experts and approved and endorsed by the SPCA, there are no side effects, no pain or fear, easy to use. Don’t make it a big production when you are leaving the house. A lot of excitement will energize your puppy and he will go into play mode only be left alone. Soon he will associate your behaviour with being left behind and will start barking as soon as you leave. Establish your leadership as the pack leader with the “nothing is free” technique. This he likes. Be it affection, praise, pettings, going outside, etc… Avoid allowing your pup to be demanding. Dog obedience training school can also be very worthwhile, as your dog will learn to focus on you when there are distractions around him. The above ideas should be a good foundation that you can begin putting into action. Stop excessive dog barking now and you and your new companion will enjoy a much happier and pleasant relationship. Hi, I bought the citronella collar when everything else failed. It works like a charm. My dog seldom has to wear it any more as I just have to have it nearby as a reminder and she won’t bark. It is so nice to be able to go for walks with her now without her barking at everything in sight!